In the world of manufacturing, every company is unique. Each has specific equipment, processes, routines and demands, however, those who are successful share something in common – they have efficient production processes. In many manufacturing sites the IT landscape is a mixture of duplicated functionality, gaps in functionality and many isolated add-on solutions as Excel sheets, paper systems and other “best-of-breed” solutions. All with the purpose of trying to connect the ERP level and shop floor level systems without a layer in between. 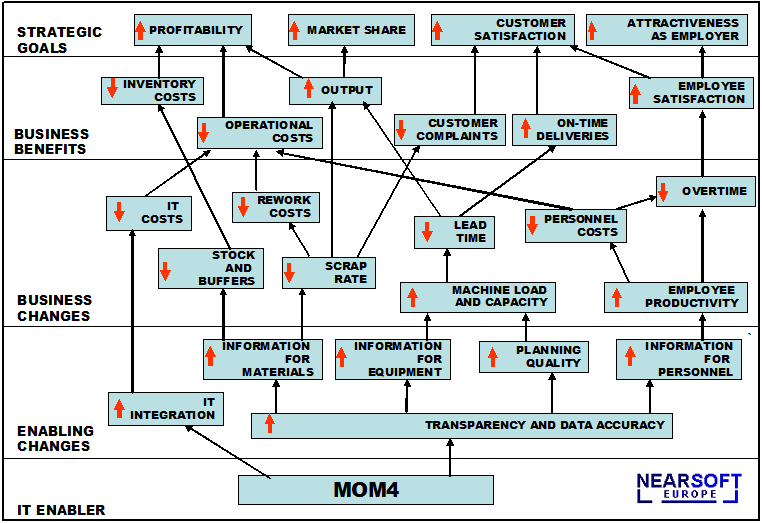 By introducing a Manufacturing Operations Management (MOM) layer between the ERP system and the shop floor level systems a predefined integration is achieved. This not only covers processes in the production but also influences the whole supply chain, distribution, quality assurance and maintenance. The expected ROI for MOM4 is less than one year. Increase asset utilization by 10-20% through better planning, optimization algorithms, decrease of the changeover times and downtime.